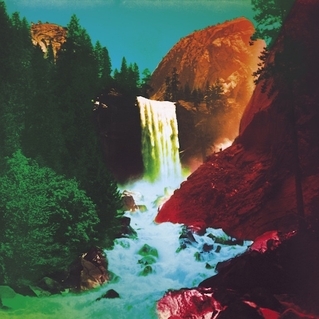 There’s more than a little shimmeriness to the wonderful new My Morning Jacket album. Whether it’s the keyboards on the opening track, ‘Believe (Nobody Knows)’, or the guitars on ‘Like A River’, this is an album that’s full of lovely little moments. The change of tempo a minute into ‘In Its Infancy (The Waterfall)’. The keyboards at the end of ‘Compound Fracture’. The steel guitar on ‘Big Decisions’. It all marks both a return to things past and a new departure for Jim James and the crew. For sure, there’s no shortage of typically anthemic MMJ moments that will get many a fist raising in the muddy fields of this summer’s European festival tour. But gone is the alt-country-meets-EDM experimentation of Evil Urges, never mind, whisper it, ‘Cobra’ from the Chocolate And Ice EP. Here, only ‘Spring (Among the Living)’ comes anywhere close to the sound that divided even the most ardent Jacketeers. Instead, what we hear is a fresher, sunnier, lighter-than-usual sounding album. But what lies beneath? There are hints of personal difficulties. “I hope you get the point, The thrill is gone”, we’re told on one song, “I hope you get the point, I think our love is done”. “I don’t quite feel like faking it again tonight”, we’re told on another, “Don’t really feel like saying everything is alright”. And title of the closer, the sublime ‘Only Memories Remain’, perhaps speaks for itself. But there’s surely more too it than that. Following on from his solo album in 2013, Jim James remains in fine transcendental form. And on The Waterfall he seems to have transmitted this vibe to his musical co-workers. In stark contrast to Circuital, it sounds like making music has once again become easier and much more enjoyable. Now that’s an uplifting thought. Posted in My Morning Jacket and tagged as Music, My Morning Jacket, Review.